We’d love your help. Let us know what’s wrong with this preview of The Eyes of Heisenberg by Frank Herbert. To ask other readers questions about The Eyes of Heisenberg, please sign up. In this obscure science-fiction novel, written at about the same time as Dune, Frank Herbert asks a question which has occupied surprisingly few SF writers: if you were immortal, what would you actually do? His answer, which will appeal to many people on this site, is more or less that you would catch up on your reading. As things are, we're so limited by our puny lifespans. Usually we just read a book once and then move on to the next one. If we liked it, we might read it a second or even a thi In this obscure science-fiction novel, written at about the same time as Dune, Frank Herbert asks a question which has occupied surprisingly few SF writers: if you were immortal, what would you actually do? His answer, which will appeal to many people on this site, is more or less that you would catch up on your reading. As things are, we're so limited by our puny lifespans. Usually we just read a book once and then move on to the next one. If we liked it, we might read it a second or even a third time. If we really liked it, we may occasionally go further: read books that it refers to or that influenced it, check out a biography of the author, perhaps find a doctoral dissertation that provides further details. Even though we know we could do a whole lot more, we don't have time. But suppose we could count on living to two hundred thousand. If we thought a book was interesting, we could spend a century reading it properly. We could become fluent in Polish or classical Japanese to get all the nuances of the original, visit the places it mentions, check out every single book that the author might have read, learn to imitate their style and try rewriting the story in different ways to explore the artistic choices they had available, and finally publish our conclusions in thirty leisurely volumes. A few thousand years later, when we were busy with another author of the same period, we'd be able to reread our previous work, see how our ideas had changed and revise a few things. Maybe we'd suddenly notice an angle we'd missed first time round. Well, that's roughly how the immortals here spend their time. Of course, the underground wants to get rid of these spoiled, decadent aristocrats, and you're encouraged to sympathize with their revolutionary ideals. But I wasn't sure I agreed. I quite liked the immortals and felt sorry that they couldn't go on with their cultural studies for another few million years. Lo que nos cuenta. En una sociedad con tensiones entre Folks, Optimen y Cyborgs, el señor y la señora Durant, Folks ellos mismos y con permiso para reproducirse, van a la clínica reproductiva del doctor Thei Svengaard y exigen su derecho legal a la vigilancia del proceso al que será sometido su óvulo fecundado. Molesto pero obligado, Svengaard comienza su trabajo antes de que llegue el experto designado para ayudarle, Potter, y descubre que la mórula presenta una particularidad que sólo se ha documentado otras ocho veces: es resistente. The Eyes of Heisenberg is a fascinating glimpse at a world where reliance on genetics has become the sole principle of human survival, and embryos are carefully "cut" to a specific mold to ensure that randomization is not a factor. Earth is ruled by a class of superhumans that have forgotten how to live, and are only concerned with their eternal survival. The book is weak in some areas and strong in others. The premise is good; the story at times is lacking. Herbert's character development is hit The Eyes of Heisenberg is a fascinating glimpse at a world where reliance on genetics has become the sole principle of human survival, and embryos are carefully "cut" to a specific mold to ensure that randomization is not a factor. Earth is ruled by a class of superhumans that have forgotten how to live, and are only concerned with their eternal survival. The book is weak in some areas and strong in others. The premise is good; the story at times is lacking. Herbert's character development is hit and miss. Some are blatantly cliche: the protective father, the caring mother, the calculating cyborg. Others break out of the mold: Svengaard, at first an unlikable simpleton, goes from an unassuming surgeon to one who cares about life and what life means to others. Calapine, one of the Optimen (the ruling class), finds out what it truly means to be human and that in all of her centuries of being "alive," she has never truly lived. The plot is a bit slow at parts and Herbert perhaps over-utilizes technical terms, especially during medical procedures. Looking past this, the book is above average and also provides Herbert fans with a glimpse at many factors of Dune. Many themes that appear in Dune are explored in The Eyes of Heisenberg: immortality, reliance on pharmaceuticals, and an apathetic ruling class. Perhaps the most obvious theme is of the "dopplegangers" and their parallels the "gholas" in Dune. The character Max, who has lived through many lifetimes, can be seen as a primitive archetype for Duncan Idaho. Set in the far future in a time when Optimen lived for tens of thousand of years, The Eyes of Heisenberg is kind of like 1984 on Steroids. In this society, the rulers only allow certain people to procreate, and when they do so, genetic engineers manipulate the embryo seeking to make these superhumans, who can virtually live forever. The concept is okay, but I thought by and large the execution is poor. For one thing, I think to fully understand the story, you need an advanced degree in biochemis Set in the far future in a time when Optimen lived for tens of thousand of years, The Eyes of Heisenberg is kind of like 1984 on Steroids. In this society, the rulers only allow certain people to procreate, and when they do so, genetic engineers manipulate the embryo seeking to make these superhumans, who can virtually live forever. The concept is okay, but I thought by and large the execution is poor. For one thing, I think to fully understand the story, you need an advanced degree in biochemistry. Secondly, it was never fully explained why things were happening. Why the embryos are engineered, what was so important about the embryo belonging to the Durants, which is the focus of the story, that makes all hell break loose. The other thing that really annoyed me was how Herbert jumps from one scene to another skipping all sorts of scenes in between that are necessary to set up the scene. It almost seemed like I was reading an abridgement. So although the concept was interesting, and there was good character development in the story, I found the novel more exasperating than anything else. Enzymatic balance, genetically-altering the population, and not thinking too much about death: the keys to immortality in The Eyes of Heisenberg. Of course, the powerful rulers eventually think about it and lose their balance based on a family vs. the system scenario that is now the Hunger-Game-standard mode (this book seems like it could be popular without the long passages of pseudo-biochem Carcass-lyrics, or a version dumbed-down created for today's teens...maybe it already has been). Philosop Enzymatic balance, genetically-altering the population, and not thinking too much about death: the keys to immortality in The Eyes of Heisenberg. Of course, the powerful rulers eventually think about it and lose their balance based on a family vs. the system scenario that is now the Hunger-Game-standard mode (this book seems like it could be popular without the long passages of pseudo-biochem Carcass-lyrics, or a version dumbed-down created for today's teens...maybe it already has been). Philosophically, I like (as all humans must) the exultations of the human drive, the old natural ways, the maternal instinct, the life-affirming power of mortality, the one normal guy who can make a difference. We are meant to detest these ruling class overlords, then realize their human failures and try to understand - very cool, if standard sci-fi, ideas. Stylistically, though, this book jumped so far so fast after a huge intro that didn't even paint a full view of what this dystopia must look like, the jargon was oftentimes laughably impenetrable, and the unraveling of a massive government that could and has destroyed thousands with a wrist flick becomes a simple machine god that solves itself. Here's a taste of some of the terminology nonsense that bogs down the beginning of the text. I'll never forget the moment when Potter "shifted his attention to the mitochondrial structures, saw the evidence of the arginine intrusion. It squared precisely with Sven's description. Alpha-helics had begun firming up, revealing the telltale striations of the aneurin shifts." Nor when, sentences later, Herbert is reduced to just listing terms with no indication of the difference between them: "the first row of pyrimidines, nucleic acids and proteins, then aneurin, riboflavin, pyridoxin, pantothenic acid, folic acid, choline, inositol, sulfhydryl..."
Bizarre ending (wherein Herbert seems confused about how much people love being pregnant) would seem to set itself up for a sequel in a cyborg vs. human confrontation future. We definitely would've gotten one if it was first published today, and I'm sure Herbert's son would crank one out if anyone showed any demand. If you need some Dune-based tropes but don't want to read 600 pages of the next piece of that series, Herbert's got you here with Muad'dib classics like swallowing in a dry throat and glowglobes and most of the conflict occurring internally with italicized subconscious wandering around. Frank Herbert, best know for his Dune books, also wrote quite a few others of which this is one. And I must say, a damn good one it is. Frank envisions a world of genetic manipulation is this book, a world governed by Optimen, mortals who have been gene manipulated to the point of living forever - almost. Virtually lost from their vocabulary are words like death, killing, murder and violence. They just don’t happen any more in this sterile controlled world. Under the Optimen are the Folk, lesser g Frank Herbert, best know for his Dune books, also wrote quite a few others of which this is one. And I must say, a damn good one it is. Under the Optimen are the Folk, lesser gene manipulated mortals who only live hundreds of years. Poor them. The society is well thought out, creepy in the extreme and of course you just know it is not going to last. What perfect society ever does? This novel tells the tale of some Folk wishing to procreate on their own, and underground resistence to the overseers (the Optimen) who grand breeding licenses to those worthy. And the womb of woman is no longer used to raise children; that job is left to vats. All people in the cities are fed a constant mixture of gas, gas which renders them sterile and infertile just in case any "viable" humans are in the population and get the funny notion of procreating on their own outside the Optimen’s control. And the creepiest of all. Any gamete which is found to be viable (a normal reproduction capable human) during the artificial procedures to join sperm and egg, is exterminated because it would ruin the world order if it ever escaped. But the underground is fighting for just that, and they may soon win. Cyborgs also play a pivotal roll in this society and they also have plans of their own. Now all of this may seem old hat, especially if you have been watching the Discovery or the Space channel the last decade or so, but remember this was written back in 1966. After reading this book I can safely say Herbert is a master storyteller. I recommend this book for its ideas, plot, suspense - hell pure entertainment. Not very good. A dystopia ruled by a class of Overmen, ageless and genetically perfect comes across resistance when a chance embryo has the possibility to escape their control. Cyborgs and an underground group of parents try to stay one step ahead of them. It's a dull and abstract book. The embryo serves as a Mcguffin, and the characters are bland and not particularly likable. The ending is a cop-out, with no real foreshadowing. The theme is okay, and deserves a better book: it's the idea that in Not very good. A dystopia ruled by a class of Overmen, ageless and genetically perfect comes across resistance when a chance embryo has the possibility to escape their control. Cyborgs and an underground group of parents try to stay one step ahead of them. Somewhat interesting premise. Weak ending. As a fourteen year old, I stepped onto the sands of Dune, introduced to the worldview and metaphysics of Nietzsche, Cynics, Agnostics, all wholly alien to my teleological, Roman Catholic worldview. I appreciated vicariously experiencing the emotions of those in this intense metaphysical struggle, as well as having my own fears and doubts drawn with flourish across a lavish sci-fi landscape. Sumptuous and unique to anything I have experienced since (alas, even in the sequels to the first and seco As a fourteen year old, I stepped onto the sands of Dune, introduced to the worldview and metaphysics of Nietzsche, Cynics, Agnostics, all wholly alien to my teleological, Roman Catholic worldview. I appreciated vicariously experiencing the emotions of those in this intense metaphysical struggle, as well as having my own fears and doubts drawn with flourish across a lavish sci-fi landscape. Sumptuous and unique to anything I have experienced since (alas, even in the sequels to the first and second books), 'Dune' remains of the books I would choose to preserve in an apocalyptic library. Now I wonder if I would add another of Herbert's works to that shelf. Many have sneered and told me that had I not read Herbert as a teenager, I wouldn't have been so impressed. Reading this book as a 34 year old, I can reply with certainty that that is incorrect. In 'The Eyes of Heisenberg', I see a very intriguing flip to Dune's thesis. The Bene Gesserit and even the Kwisatz Haderach found it necessary to manipulate humanity to turn it into a super race. Yes, I count Leto's oppression and sacrifice as such a manipulation; even if he wanted the uncontrolled violence of the Scattering, he had to provoke it. His message to Darwi Odrade in the old Sietch Tabr confirms that the Bene Gesserit also had had the ability to build the Golden Path with him. Frankly, I think Herbert's thesis in the Dune chronicles was either a contradiction or a paradox he himself had not resolved. I truly think the story's natural end was when Paul walked into the desert in 'Dune Messiah', refusing to play a part in the totalitarian machinations any longer. His uncertainty mirrors the author's. This book, however, flatly states not only is such control undesirable, it is ultimately impossible and undesirable. It's an incredible dystopian thriller with empathetic characterizations, intriguing world-building, and while the premise is black and white, the people and factions are not. Regarding the actual science, I am not a geneticist, but it seems at least that Herbert has superbly walked the fine balance between completely glossing over scientific facts with technobabble and getting bogged down with the science of his day, destined to become obsolete in ours. A layman should be happy with it. I do see many complaints about the ending, calling it weak. How so? (view spoiler)[ The immortal Optimen can only defy degeneration by defying change. Changes and mutations are generally bad for existing organisms. They mean cancer and eventual, or immediate, death. The change introduced by the ultra-rational Cyborgs made perfect sense, and it made sense that fallible beings would fall for it. After all, pouring an infinite amount of water into a mug won't cause it to contain an infinite amount of water. I love that which Jung called “synchronicity.” It seems like our thoughts or experiences are often on parallel lines which unexpectedly converge. When I found Brian Herbert’s Eyes of Heisenberg, I assumed it would be a plot based around Werner Heisenberg’s “uncertainty principle.” I wasn’t expecting to find a novel that dovetailed with the material on genetics in a recent book I read by a neuroscientist, Mind of God: Neuroscience, Faith, and a Search for the Soul. Mind of God sees evidence for p I love that which Jung called “synchronicity.” It seems like our thoughts or experiences are often on parallel lines which unexpectedly converge. When I found Brian Herbert’s Eyes of Heisenberg, I assumed it would be a plot based around Werner Heisenberg’s “uncertainty principle.” I wasn’t expecting to find a novel that dovetailed with the material on genetics in a recent book I read by a neuroscientist, Mind of God: Neuroscience, Faith, and a Search for the Soul. Mind of God sees evidence for purposeful, hence “directed,” evolution as the author considers genetic progress and stability. Eyes of Heisenberg considers a future where scientists are attempting to direct evolution by surgically gene-splicing human progeny toward immortality. Yet, Herbert posits a force within evolution itself that works against this human manipulation. This mysterious force is interesting as its own idea, but the plot “sickens.” In Eyes of Heisenberg, this utopian ideal is supported by use of the general population as breeding stock for those “fortunate” few who have become the near-immortal Optimen. Alas for the Optimen. reproduction isn’t compatible with immortality while recreational sexuality has not been bred out. So, these optimal human specimens are prone to get bored with each other and use the lesser beings as toys. There is an overt cruelty about these Optimen. Hence, it is not surprising that an underworld movement has been formed among the ordinary humans. What is surprising is the solution chosen by this underground in order to level the playing field with the Optimen. I wasn’t expecting that. Prior to reading this novel, my experience with Brian Herbert had been restricted to his initial Dune books and, of course, his influence on the sequels penned by his son and Kevin J. Anderson. Eyes of Heisenberg will force me to seek out more. Though the factions in Dune are more ornately constructed, the nascent class warfare implied in Eyes of Heisenberg is sufficiently crafted to stimulate insights on power, resistance, and revolution on a broader scale than a mere action novel set in the future. To be sure, there are some fascinating action scenes, but it’s when the characters speculate on what it means to be human as both individuals and as a corporate entity growing toward some destiny or goal that the book reaches its apex. On retrouve bien sûr l'obsession de Franck Herbert pour Heisenberg et son travail. Ce livre ne contient en tout et pour tout que 3 personnages féminin : Mrs Washington, l'assistante du chirurgien (qu'on n'évoquera plus après la page 18) ; Lisbeth Durant, cantonnée à son rôle de mère tout au long du roman (surprotectrice, à « l'instinct maternel surdéveloppé ») ; et Calipine, une Optimhomme, femme dirigeante aux côtés de Schruille et de Nourse. Une critique On retrouve bien sûr l'obsession de Franck Herbert pour Heisenberg et son travail. Une critique de l'immortalité et de la toute-puissance : les Optimhommes ont cela, et pourtant ils sont enfermés dans un carcan qui les condamne à la passivité, au rôle de spectateurs même dans leur propre vie, et à l'ennui. Un contrôle absolu de la population à la Orwell (jusqu'à leur pensées et leurs sentiments « La culpabilité était interdite aux membres du corps médical, car la culpabilité conduisait immanquablement à la trahison » « La nuance critique impliquée dans cette pensée suscita une crainte éphémère chez Svengaard, qui avala sa salive et se força à se concentrer sur le répons que la Masse adressait aux Optimhommes : Eux nous dirigent, eux nous aiment, eux prennent soin de nous. » p8). On retrouve également le culte de la personnalité (la Masse doit adorer les Optimhommes, c'est presque une religion planétaire et ils sont presque des dieux ; les individus ordinaires lorsqu'ils sont autorisés à s'adresser à un Optimhomme doivent le regarder et s'adresser à lui en utilisant son prénom dans chaque phrase). La Résistance des humains à la tyrannie parce que... même s'ils ont des vies parfaites équilibrées et paisibles, il leur faut la liberté et le libre arbitre. Fait important également, dans cette société ils sont coupés de leur passé (pas vraiment de parents, ni de patrimoine génétique, ni d'ancêtres... pas de racines). (view spoiler)[Prototype du ghola Duncan Idaho, à travers le personnage de Max Allgood, chef de la sécurité auprès des Optimhomme, qui les adore, mais finira par se rebeller parce qu'il découvrira qu'il n'est qu'un des multiples doubles de lui-même utilisés à ce poste. Dès qu'un Max Allgood ne convient plus ou se rebelle, les Optimhommes le tuent et le remplacent par un autre double Max Allgood. Dans les yeux d'Heisenberg également, les doubles sont de moins en moins bonne qualité, changent au fur et à mesure des clonages, alors que c'est le même patrimoine génétique (→ évoquation d'une mémoire génétique d'un individu à l'autre chère à Franck Herbert). « Quel Max... avait-elle effacé ? Il y en a eu tellement... un modèle vedette pour notre sécurité. Elle pensa aux autres, une longue lignée de Max qu'on éliminait tour à tour dès qu'ils avaient cessé de plaire. Leurs images se multipliaient à l'infini comme dans un jeu de miroirs. Que peut bien représenter l'effacement pour un être comme lui ? Moi, je suis une suite continue mais un double n'a pas de mémoire ? Un double ignore toute continuité. A moins que les cellules n'aient une mémoire. », réflexions de Calipine, p194. Heisenberg, as in uncertainty, starts this story off and becomes the rationale for all the subsequent actions. In this far future society, there are grades or castes of people. They are arranged by their genetics: the top are immortals, next come, the almost immortal, at the bottom are the ordinary people. The story starts with some lab preparing to process a zygote for a couple who were lucky enough to be chosen for having a baby. The zygote is examined by the doctor and he sees some unexpecte Heisenberg, as in uncertainty, starts this story off and becomes the rationale for all the subsequent actions. In this far future society, there are grades or castes of people. They are arranged by their genetics: the top are immortals, next come, the almost immortal, at the bottom are the ordinary people. The story starts with some lab preparing to process a zygote for a couple who were lucky enough to be chosen for having a baby. The zygote is examined by the doctor and he sees some unexpected change happen that makes this little one special, even more special than the immortals. He and the technician silently agree to keep the knowledge secret so the zygote will be allowed to grow up. Thus starts the chase for growth and development in this stagnant society. The immortals are forty thousand (40,000), or more, years old. This age is inconceivable to us, and for most of that time they have ruled and do not allow any change. Anything that reminds them of death or decay is not recognized or spoken of. They are separate from everyone else. They rule by fear and from their little Olympus encampment. They think very little of destroying everyone in an area, they can be replaced, even if it takes a thousand (1,000) years, it is only a little inconvenience to the immortals. These immortals have a tribunal that rules daily life, and as they come to understand that the zygote is special and try to find it, etc., they bring about their own destruction. You never find out quite what is so special about the little one, but the parents and attending doctor protect it, and, in the end, implant it in the woman for carrying. This becomes the seed for the new society that will be born from all this destruction. (Puns are wonderful, eh?) Everyone has hormone treatments to help them live life to the optimum best. Carrying a baby to term is a natural way to adjust and control hormones in a human, so everyone gets to have a baby to this end. This is an interesting story because you never know what causes all the commotion (the zygote change), but everything turns out for the better. Uno de los libros más extraños que he leído. Al principio me ha parecido una especie de degeneración de Dune y el cuidado en encontrar a su Kwisatz Haderach, pero poco a poco se ha perfilando como una lucha entre la supervivencia de las diferentes especies sometida y clandestinas en un ecosistema controlado por seres casi inmortales. Cuesta un poco arrancar con la cantidad abrumadora de datos técnicos que ofrece el autor en la modificación genéticas de los seres. Pero pasa esas páginas, que por o Uno de los libros más extraños que he leído. Al principio me ha parecido una especie de degeneración de Dune y el cuidado en encontrar a su Kwisatz Haderach, pero poco a poco se ha perfilando como una lucha entre la supervivencia de las diferentes especies sometida y clandestinas en un ecosistema controlado por seres casi inmortales. Cuesta un poco arrancar con la cantidad abrumadora de datos técnicos que ofrece el autor en la modificación genéticas de los seres. Pero pasa esas páginas, que por otro lado para el lector lego resulta poco más que curiosas, se revela una historia con un futuro mucho más marcado y condensado en las pocas páginas que tiene el libro. Herbert, no decepciona y aunque es un libro muy bajo en su biografía, es capaz de componer las desigualdades entre seres de la misma especie, con una filosofía evolutiva bastante concentrada. La parte genética queda poco después diluida por la propia historia y sólo al final, cuando encuentran la solución a los problemas de todos, vuelve a resurgir la esperanza de todo lo aprendido. Libro corto, inquietante por el futuro apocalíptico, pero intrascendente para el que busque un poco más de profundidad. A novel of the early understanding of the dangers of genetic manipulation, and the sterility of a fully eugenically controlled world. Echoes of the Those Above/ Those Below duology by Daniel Abrahams in the society of the Optimen, in that they have become entirely detached from and largely indifferent to the world. Like much of Herbert's short fiction, you can see him testing out ideas which will be deployed in full form in his Dune masterwork. In this case, notions of genetic cloning, ability to A novel of the early understanding of the dangers of genetic manipulation, and the sterility of a fully eugenically controlled world. Echoes of the Those Above/ Those Below duology by Daniel Abrahams in the society of the Optimen, in that they have become entirely detached from and largely indifferent to the world. Like much of Herbert's short fiction, you can see him testing out ideas which will be deployed in full form in his Dune masterwork. In this case, notions of genetic cloning, ability to read innermost thoughts through expression and bearing, and battle-language/ touch communication. A nice dystopian story. Once again humanity has made itself into multiple classes of elite and workers and poor. No one is happy and society is starting to break down. Along comes the trigger that blows all of the nicely set up structures and sends everything out of control. In this case its a baby who will be fully human and beyond the elite's control. In the end all the players come together triggering a distaster amoung the elites that results in them having to relise and rethink thier status A nice dystopian story. Once again humanity has made itself into multiple classes of elite and workers and poor. No one is happy and society is starting to break down. Along comes the trigger that blows all of the nicely set up structures and sends everything out of control. In this case its a baby who will be fully human and beyond the elite's control. In the end all the players come together triggering a distaster amoung the elites that results in them having to relise and rethink thier status and needs of the rest of humanity. A very good read, I enjoyed. If I had read this book rather than listened, I think I would have given it 4 stars. Listening, though, was a serious drawback. There were many places I wanted to go back and reread a section but it was too difficult. The audio version also made it more difficult to follow the events. 3/10. Media de los 9 libros leídos del autor : 7/10. A ver, de Frank Herbert hay que leerse Dune, sí o sí. Al menos el primero de la saga (me gustaron casi todos, conste). ¿Y el resto?. Pues bien, pero no esperéis un nivelazo. Me lo he leído entero porque... Frank Herbert! Pero tiene 1,5 estrellas. No me ha llegado nada la historia ni los personajes y eso que resulta fácil empatizar con ellos. En fin, no he tenido suerte con estas últimas novelas cortas que estoy leyendo. It was a good piece of old-fashioned science fiction. There were definitely some parallels with the Dune books when it came to the rulers cloning their favorites so they would always have them in their service. Overall, it was a quick, enjoyable read. It's good, in that I admire the author and sympathize with his themes, but Dune covers the same ground MUCH better. I would be so disappointed if anyone read this before Dune, or even read this instead of reading Dune for a second time. The author's obsession with these themes does make me more likely to read his biography to find out his backstory! I'm a fan of Frank Herbert and read a good amount of his books. Of course, the Dune series is the stand-out. This book was average to me. You can't have a winner every time. I really enjoyed this. Short but sweet. Interesting ideas. Thought provoking in terms of genetic engineering. Hard to follow, in fact I am not sure what happened. May have to re-listen. Scott Brick was great. Meh. Frank Herbert is a phenomenal writer, but this book was underwhelming. Great premise and build up but the ending was lame. I liked this book, even though there were a lot of elements and themes that I recognised from the Dune books. I thought the characters were a little bland (but maybe that's just because reading this made me miss the Atreides family), and there were too much medical terms that I think very few readers understand. So overall not the best Frank Herbert book I have read but still very entertaining. "There's a caprice in our universe. [Heisenberg] taught us that. There's always something we can't interpret or understand... or measure." The principle of indeterminacy in the words of gene surgeon Potter, who appears in the first pages of the book. The plot is set in a distant future, where natural selection has been overruled by the capacity of humans themselves to alter genes and to determine their offspring. The world is ruled by the Optimen, a caste of immortals who genetically determine th "There's a caprice in our universe. [Heisenberg] taught us that. There's always something we can't interpret or understand... or measure." The principle of indeterminacy in the words of gene surgeon Potter, who appears in the first pages of the book. The plot is set in a distant future, where natural selection has been overruled by the capacity of humans themselves to alter genes and to determine their offspring. The world is ruled by the Optimen, a caste of immortals who genetically determine the population of the world, splitting it in an artificially selected and bred caste of "breeders" and those who are sterile. Breeding is made possible only thanks to the gene surgeons, who adjust and define the genetic characteristics and the future of each embryo. 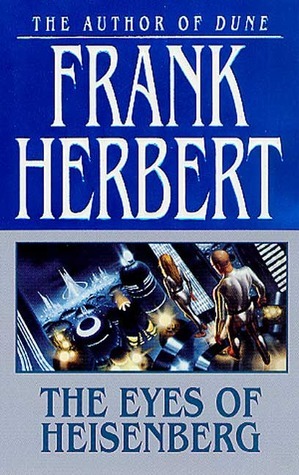 Frank Herbert describes a world where the use of technology has upset the biological stability of the reproductive system, where the birth of each individual - and the evolution of the species - is carefully scheduled following the logic of the Optimen. But one day, that "something", an interference (which isn't defined by Herbert, but is called "the rhythm of life" or God, depending on the character), a reflection of Heisenberg's uncertainty, asserts itself and originates a new completely viable embryo, that could make the whole Optimen system crumble and would make the gene shaping process useless.